A private “First Look” or “Reveal” before the wedding ceremony has been around for many years. What is a First Look? This is the moment where the bride and groom see each other for the first time in a private location. 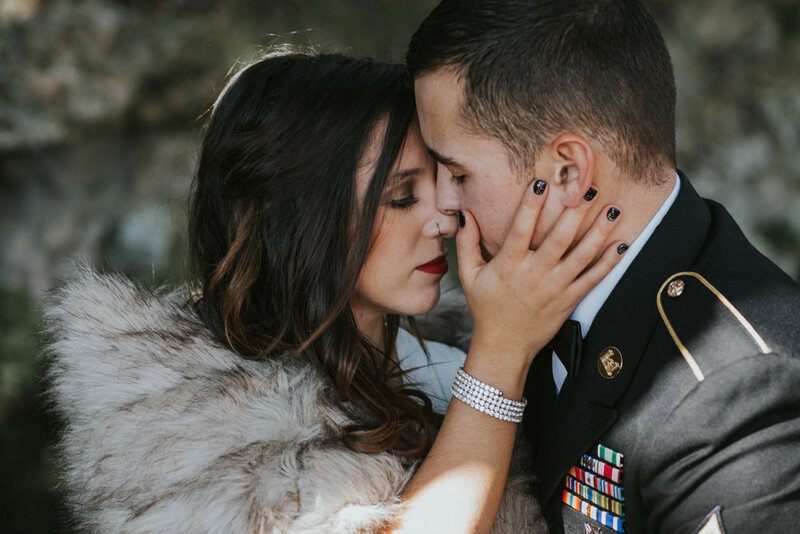 They share a special moment while the photographer captures every hug and kiss. From having extra time with your significant other to being able to enjoy spending more time with guests after the ceremony, there are so many reasons why a First Look is beneficial on your wedding day. Choosing to do a first look before the wedding ceremony is certainly not for every couple, but brides and grooms who do often say it allowed them to enjoy the wedding ceremony more. This is because when they were able to move past the wedding day jitters of seeing their future Mr. or Mrs. for the first time they had a more clear head. The clarity allowed the couple to better absorb the enormity of the day while also helping bring a level of calmness. You’ve just finished with the hair and makeup artists. It’s before the ceremony, the photos, and the party. You look absolutely stunning - possibly the most gorgeous you’ve ever looked in your life. This is your moment to shine - and what better moment for your partner to see you than this one, at your very best? First look photos capture couples together looking like perfection! When the bride walks down the aisle, all eyes are on her. She’s in the spotlight, every movement being watched with anticipation by friends and family. It’s a spectacular and grand moment, but it’s also a public one. Making the first look private allows the couple to be natural together, to relax, to express their feelings for each other without worrying about anyone else around. we’ve also observed that couples are far more relaxed during the ceremony. The moment you see each other for the first time is once in a lifetime. It’s nothing short of pure magic. We truly believe this moment is best shared privately, away from the pressure of tons of friends and family. It’s the only time the couple really get to share together, alone, for the entire day. Having the first look be private is relaxing and makes for beautiful images! You can have a moment to yourself to talk, pray or just check out each others outfits!! At the ceremony you see each other for the first time, you are surrounded by 100 or more people, you don’t really have the opportunity to say more than Hi!, You look great! or I love you. With the first look, once the photos are taken of your first reactions you photographers will leave you alone to have a moment to yourselves. As a photographer, our favorite outcome of a First Look is the imagery! The photographs of bride and groom together are incredibly emotional and lovely. These images capture such intense excitement and love between the couple. These photos end up becoming some of the most treasured shots of the entire wedding. We’ve had numerous couples say that their most beloved favorite images are from the first look. We can’t recommend it enough!